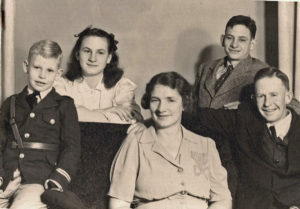 Ruth and Herman Duncan with their children, from left, George, Sara, and Leonard. Early 1940s, probably in Oregon. Editor’s note: The following is an account of Zink family history and growing up at the Waterfall Ranch. It was written by Ruth Zink Duncan in August 1992 for younger brother Howard. Ruth Zink was born to John J. and Ida May (Dickerson) Zink on November 11, 1907, in Loup City, central Nebraska. She had two husbands: Benjamin Yearwood (1898-1949), whom she married in 1925; and Herman Duncan (1906-1969), whom she married in 1934. Ruth died on January 15, 1997, age 89, in McCall, Idaho. Sarah Jane Zink – Her first husband was a civil war deserter, and was shot. This left Grandmother with 3 little girls: Nannie, Annie, and Inez. Nannie lived to be grown. She married Coke Ballard, they had 6 daughters: Grace, Nora, Maude, Jessie, Bethel, and Ruth. Annie died about 5 years of age with green sickness. Inez fell off a chair and broke her back, she died at age 5 from the injury. During the Civil War, Grandmother and the little girls had nothing to eat, but a neighbor man told grandmother to go into his corn field and help herself. She would shell the corn, pound it up, and with water, make a gruel. Sarah then married James Zink – To this family was born Marion, Martha, John J., and Clarence. Marion went to the stock yards to buy steers to fatten. Crooks lay by for those farmers to rob them. He was injured so severely he lost his mind, did not live long. Martha married Allie Hayes; they had one daughter, Bertha. I personally got acquainted with Uncle Allie and Cousin Bertha in the 1940s. They lived at New Plymouth, Idaho. Uncle Allie told me Grandma Sarah Zink was an angel on this earth, and he believed Grandpa James Zink was the meanest man he had ever known. Clarence Zink lived at Nyssa, Oregon. I met him and some of his children, but never knew them. Both James Zink and Albert Dickerson were Nebraska legislators; they concocted the meeting of our parents. When first married in March 1902, Ida May Dickerson and John J. Zink moved to Ashton, Nebraska, a Polish settlement. Father had a barber shop, a confectionary store, served meals and rented beds upstairs. All the stories they told about that episode … they soon decided that was not the life for them. Their eldest child, Leonard, was born July 16, 1903. Then they lost a premature baby boy. Mother went in between two milk cows to stanchion them, they came together and squeezed Mother until it killed the 8- to 9-month baby boy. Zelma was born March 24, 1906. During the time we lived in Animas City, a suburb of Durango, father was a real estate agent. He was with Bea Glasier, a real small man, a Jew. Father took Bea fishing; he couldn’t get too far from camp for the toilet. Mrs. Glasier was real normal, Bea had his ways. I don’t think Father was interested in gold mining, he seemed to me to enjoy helping to open new territory and go forward permanently, not in a harem scarem sort of way. Durango was a new territory when we went there. Grandpa and Grandma Dickerson came to visit in 1910. We went to the fair by team and surrey. Target practice was being held toward the street. One bullet missed the board, and shot through one of Grandmaʼs eyes. Leonard had a deep scar over one eye and pieces went into Motherʼs eyes. Grandpa was trying to control the team with all the screaming and bleeding. Father was one of the judges at the fair. Grandmother lost her eyesight; she was a very strict Christian; she always said God was punishing her for going to the fair on Sunday afternoon. A Dr. Davis took care of Grandmother, and the families became good friends; they visited us many times at Hermosa. Dr. Davis always brought a large sack of candy; he would hide it and then tell us he saw a bird with a sack of candy, and we had fun finding it. Grandma Sarah came to Colorado to live with John, Ida and family somewhere around 1910. I don’t remember Grandma much, but have been told she spoiled me. Grandma was happy living with Ida; she said Mother (Ida) was better to her than her own daughter. Early years in Colorado were hard years. Ida had bad rheumatism. Albert E. was born August 20, 1910, at Animas City. I (Ruth) had surgery on the kitchen table for an umbilical hernia. An old maid nurse was hired to take care of me. Then, Grandma Sarah had a stroke while trying to help, fell and broke her back. Nurse Smith stayed on taking care of me and Grandma Sarah until Grandma died. This was 1912. She lies buried in Greenmount Cemetery in Durango, Colorado. About 1912 we moved to the Dudley place in the valley near Hermosa. Ida Blanche came November 1, 1914, a Sunday afternoon. Nurse Smith helped again. As we left for school next morning, Mother said, “Now don’t go to school and talk about your baby sister all day.” Our neighbor just across the road, Mrs. Meade, did not hear about the baby until it was in the paper. She came over quite shook up. John W. came December 12, 1916. During this time, the stone house was built at Waterfall Ranch; it was a long, hard job. Father mashed a little finger handling stone, a year later had blood poison and lost the finger. When he got out of the hospital, he went to San Diego, California, to visit Grandpa Zink and recuperate. Our father made several trips out to visit him. First trip was around 1915 or 1916, somewhere along there, while we still lived at the Dudley place. Leonard and Zelma were in high school, so I quit school to help Mother at home. We sorted apples and potatoes all week. We would get one of the Ross boys to come on Friday morning and load the wagon for me. I delivered apples and potatoes to homes all over Durango, took eggs and butter to the store, and brought all the kids from high school home after school. Seemed quite a distance those days. Leonard and I would haul hay on Saturdays to fill the feed bunks on Sunday afternoons. Bert usually went along to take the kids back to school. Father always wanted the Waterfall to be a landmark. In those days, the stone house was built for something around $12,000. Oh! to think what it would cost now. He had three stone masons working. What I remember most was helping get food to feed all of us. Mother had a big garden, vegetables to gather and clean, chickens to dress, fruit to pick. Mother baked all of our bread and pastries, felt there ought to be a little extra for hired help. We moved to the Waterfall Ranch spring of 1917 or 1918. Father planted the field east of the railroad track and north of the lane in potatoes; that was when the big potato cellar was built to take care of the bountiful crop. No piece of ground had a crop like that again. Prices went to 11 cents, unheard of before. There was some jealousy over the new house, water in the house, and the power plant. Mrs. Ross, a heavy lady, wanted to come and take a bath, then wanted Mother to bathe her. Mother did not feel that was necessary. Mrs. Ross called Mother a big-mouthed heifer. That did not go over too well. Mother was happy with the electric iron. Ironing was a job back then. Brother Ernest was born November 2, 1918, in the old house near where John and Ruby built their new house. Influenza that year closed schools. Mother had blood poison, a bad abscess formed in her side that had to be operated on. Zelma was badly sick with rheumatism, and father took Zelma to the hospital. A neighbor lady, Mrs. Teal, took care of Ernest at her home. Then John got sick. Mrs. Pryor came one night, through deep snow, with frozen feet, to help take care of John, and took him home with her. Next day, Mrs. Teal got sick, and we had to go get Ernest. I, Ruth, was 11 years old trying to take care of that tiny baby and he was sick. God undertook for our family, we all made it. Soon after mother got home, Ernest was doing much better, Zelma much better, but was troubled with rheumatism all of her life. Brother Leonard was in school, and he boarded in Durango. He had the flu and was real ill. Zelma and I had the flu the next spring and it was not nearly as hard. The rest of the family escaped. Howard Earl was born March 26, 1923. We were a happy family. When sickness or whatever troubled one, it troubled all of us. We were all taught to work. Taught about our Lord and Savior Jesus Christ, attended Sunday School regularly at the grange hall. Now and then had preacher Uncle Sye? Latten, who preached many years; he farmed and was a blind man. Iʼm sure you remember him. After Mother died (1926) was a very hard time. Leonard and Ruth were married, Zelma soon married. No doubt you heard about Bert taking violin lessons. Going to a fancy lawyer’s home to take his lesson after skinning a skunk. Those were hard times on Blanche, John, Ernest, and Howard. Blanche tried hard to keep house and go to school. She was just a little girl. I believe it was hardest for Blanche. She is a happy, well-adjusted lady today. Last week, she wrote she has 19 grandchildren, what a record. She sews, crochets, and knits for all of them. We all like Mural, he is so good to Blanche, and she deserves every bit of it. We all hung in there as the old saying, “Blood is much thicker than water.” Don’t you imagine father would enjoy Politics now? He would have made a good President.